About Silver Lunar Dragon: “The moon is a portal through which divine feminine light pours onto Earth. It bathes the planet and more specifically connects to our causal chakra and helps to activate it. Recently, seventh dimensional silver lunar dragons have been able to access this portal and stream into our dimension, particularly when the moon is full. They carry divine feminine light in their energy fields and their mission is to touch us with it to prepare for the golden future. For 10,000 years we have been influenced by the masculine. However, in the new Golden Age, the feminine qualities of peace, harmony, equality, cooperation, love, unity adn wisdom must harmonize with the masculine. So silver lunar dragons are very dynamic now, because they are actively bringing about the balance of yin-yang energy on the planet. 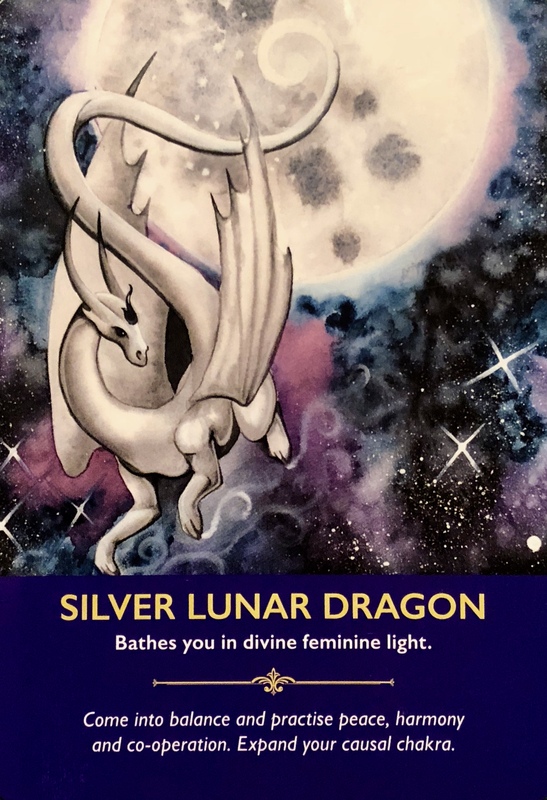 Guidance: “Choosing this card suggests that you call on the silver lunar dragons to bathe you in their energy and that you practice peace, harmony, equality, co-operation, love, unity and wisdom in your daily life. A lunar dragon will be close by, helping and supporting you. As you are bringing yourself into balance, you are doing your part to bring the planet into equilibrium. Full moons are magical times; a blessing as the opening of an energetic portal of light and possibility reveals itself to us each and every month. What will we do with this sacred opportunity? What can we create? Can we aim to be a part of something much larger than ourselves? How can we be of service? What do we wish to focus our intention and bring from the unmanifest to the manifest realm? What do we need to bring from the darkest depths of our being into the light? This full moon will assist us to do just that, revealing the main parts of our shadow selves that has been holding us back. Bring these parts into the light and bring yourself into balance. There is no need to hide anymore. This card asks for a large measure of both faith and imagination. Faith in magic and mysteries beyond our belief systems, beyond our five senses and beyond our comfort zone. A belief in possibility. Could we stretch our imaginations to include the mythic creatures of higher dimensions? Could we accept assistance and healing from dragons and unicorns? Or is there a part of us that just can’t allow ourselves to open and expand into that kind of childish wonder. The world needs more magic right now. Not silly, fluffy, flaky magic. And not deception or illusion. Real magic. Healing magic. The magic of the Universe beyond the grasp of our standard human consciousness. This kind of magic requires us to reach beyond our limiting physical bodies and minds and invite in something new. Learning to clear, open and activate our causal chakra will assist us in connecting with higher dimensional beings of Light and love. Angels, guides, mystical creatures. Anything is possible on the night of a full moon.